Rereading the Fantastic Four comics from the start. It’s a somewhat more down-to-Earth tale in issue #78. 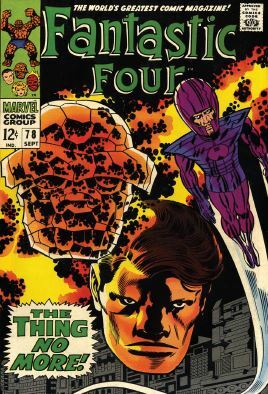 We begin with some housecleaning from the previous arc, as Reed, Ben and Johnny emerge from the Microverse, and we spend a page with them discovering that their plan worked, and that the Silver Surfer worked out a deal with Galactus and save the Earth. 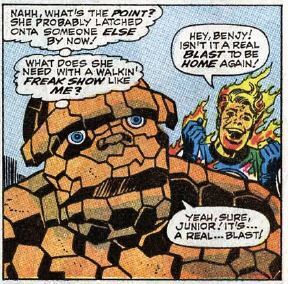 Ben considers checking in with Alicia, but he once again does the pity party thing, wondering how she could ever love a monster. Johnny won’t hear it, so he takes off out a window and flies around New York, grateful to still be alive. Among the spectators watching Johnny, we find the Wizard. A newspaper headline in the foreground conveniently tells us that he’s been released from prison, where we last saw him in issue #57. He vows revenge on the Fantastic Four. Johnny flies back home and asks where Crystal is. Ben says she’s at the maternity ward with Sue. 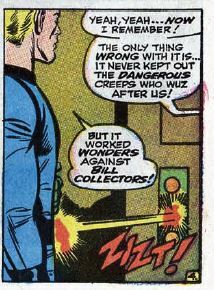 Then there’s a bit of business where Ben has forgotten how to use the elevator, and Johnny once again demonstrates how the FF uses cool gizmos on their belts to operate it. (Why weren’t these things in the movies?!?) Then there’s even more comedic business as they clean up some of the wreckage leftover from their previous adventures, with Johnny burning stuff to ash as his form of “cleaning.” They also tour the garage/hangar for a look at the Fantasticar and Ben’s jet cycle. Reed calls them back to the monitor room. He says there’s no news on Sue’s condition yet, and that he has something for Ben – another attempt at a cure. Reed promises that this time, it’ll be permanent. Elsewhere, the Wizard tries on a new pair of gloves he’s invented, which give him superhuman strength, capable of smashing an anvil. He believes that this, along with his usual anti-gravity devices, will be enough to destroy the FF. Back in Reed’s lab – the “chem room” to be specific – Reed hands Ben a test tube full of strange liquid. Ben drinks, and passes out (we’ve all been there, dude). His body then releases all of its cosmic energy, and one swarm of Kirby dots later, he’s human again. We take a break from the action to check in with Sue and Crystal at the hospital. The doctors are whispering dramatically to each other, and Crystal demands to know what the deal is. 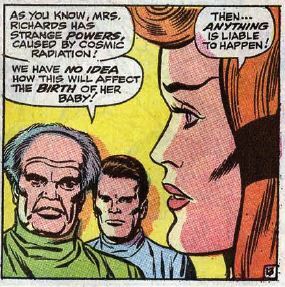 The docs reveal that the cosmic radiation that gives Sue her powers is in her blood stream, and they have no idea how it’ll affect the baby. “Then anything is liable to happen!” Crystal says. Back to the fight. Reed and the Wizard – who’s still calling himself the “Wingless Wizard,” amusingly – throw each other around the room for a while. Then there’s a strange run of a few pages where, for some reason, Ben still believes he has all the strength he has as the Thing. He can’t punch very hard, he can’t lift heavy objects, etc. The Wizard delights in this, kicking Ben around like a schoolyard bully. Reed rescues Ben from being thrown against a wall, knocking himself out in the process. Johnny rejoins the fight, trapping the Wizard inside Reed’s high-tech centrifuge device, spinning the Wizard around like crazy. Reed and Ben recover, and Reed is shocked to see Ben is still human, even after everything that has happened. 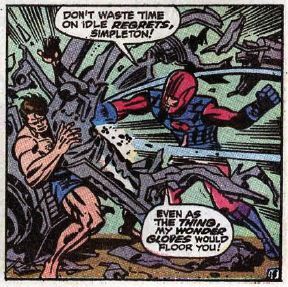 Johnny confiscates the Wizard’s gloves, but the Wizard still manages to escape with his anti-grav tech. He flies off, still swearing revenge, and Johnny retorts that the FF will be ready for round two. Ben continues to be down on himself, upset for not being able to help during the fight. He considers turning back into the Thing, to be there for his teammates. Reed says Ben must make a decision. If he stays human, he won’t be able to clobber the bad guys, but if he turns back into the Thing, he’ll never be human again – ever. Unstable molecule: One wonders why, with his wife in the hospital, is Reed concocting Ben’s cure now? 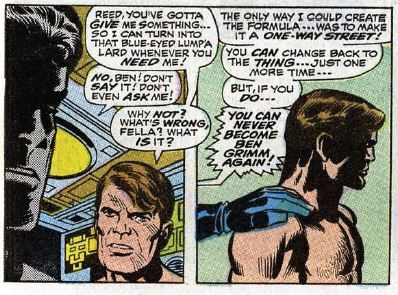 Does Reed feel unable to help Sue, so he’s overcompensating by helping Ben? Whatever. He stretches his hand into a gigantic fist to punch the Wizard. Fade out: Sue spends the whole issue sleeping. Nice to see Crystal not take any crap from the doctors, though. 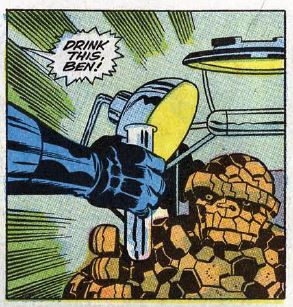 Clobberin’ time: It’s never made clear why Ben believes he still has superhuman strength after becoming human again. It a needed story point, to emphasize the seriousness of the choice he must make, but it also makes him look really dumb. Flame on: This is a great issue for Johnny, as he not only outfights but outsmarts the Wizard. He also takes us on a tour of the Baxter Building, and enjoys an upbeat, joyous flight over NYC. Commercial break: It’s Bart Simpson’s spy camera! Trivia time: In addition to the Fantasticar and the jet cycle, in this issue we can also see the FF’s pogo plane, and that flying saucer they flew around in back in issue #36. Fantastic or frightful? I never like it when the villain’s only motivation is to take out the heroes, and I really don’t like stories where the heroes do nothing but hang out in their headquarters only for the villain to show up on their doorstep and pick a fight. This issue mostly sidesteps those problems, because the hanging out around headquarters stuff is really great. For as much as we all love the big action scenes, I always enjoy the “daily life” scenes, which make these characters feel like genuine people. The real drama, though, won’t be until the next issue. Next: Sophie’s, um, I mean Ben’s choice.